A 77-year-old grandmother, the named petitioner in Eleanor McCullen v. Martha Coakley, Attorney General of Massachusetts, likes to whisper sweet nothings in the ears of women she doesn’t know—but whose lives she would like to control. And by suing the Commonwealth of Massachusetts, she’s also got the ears and attention of the nine justices of the Supreme Court of the United States. 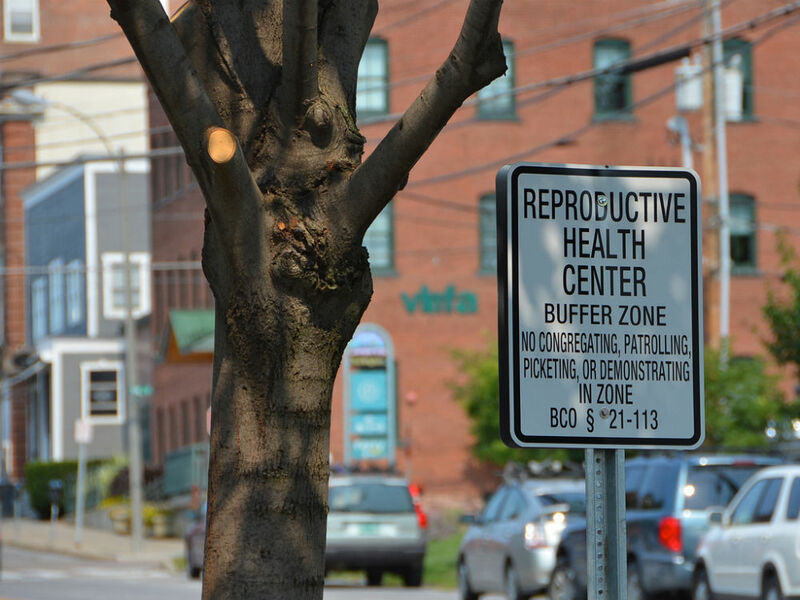 The Massachusetts “buffer zone” law that McCullen has taken to the Supreme Court allows her to do all the talking she wants, but not near the entrances to clinics that provide abortion services. The law, which was enacted in 2007 after years of violence, threats and chaos surrounding entrances to clinics, prohibits coming within thirty-five feet of the entrance to a Massachusetts reproductive healthcare facility, with exceptions for certain designated people: clinic employees, patients, emergency responders, repair people and pedestrians passing through en route to other destinations. The goal of the legislation is to prevent interference with patients’ ability to access clinics and to protect them from being lectured, harassed and abused by anti-choicers. McCullen, a member of Operation Rescue, presents herself as an individual do-gooder who shows up “where the spirit takes her,” wearing a large cross, to “gently and lovingly” approach women to convince them not to have the abortions for which they have come to Planned Parenthood or other women’s healthcare centers in the state. And while she’s there she’d like to get close enough to the patients to present tiny pink and blue knitted caps; a reminder of all that an aborted embryo or fetus will miss. There is precedent for allowing “buffer” or “bubble zones” prohibiting protesters around the offices where providers offer abortion services. Such a law survived Supreme Court scrutiny in a Colorado case more than a decade ago—but the zone is smaller—eight feet—and the composition of the Court was decidedly different than it is today. Rienzi offered that police could simply tell people to move on. But Massachusetts Police testified at trial that prior to the law’s enactment they had no way of knowing who was who in the chaos that erupted outside the Boston Planned Parenthood clinic in a city where, in support of the right to life, there has been murder—actual killings of living human beings providing services to women at abortion clinics. Justice Ginsberg commented that there is no way to know, once the line is crossed, who is there to disrupt and endanger. The United States government has weighed in on the Commonwealth’s side, with Deputy Solicitor General Ian H. Gershengorn pointing out that “there are buffer zones around political conventions, around circuses, around funerals,” and that smaller buffer zones at abortion clinics have not worked. Even if physical harm does not result, sidewalk protesters can be intimidating. At Choices, a women’s healthcare facility in Queens, New York, that I have advised, groups of protesters gather on a regular basis to try to stop women from approaching the building. Some—dressed in pink and blue aprons, displaying posters of what they say are aborted fetuses, and shouting at “the baby killers”—have surrounded patients so they couldn’t enter the clinic. New York police either do not know the buffer law—fifteen feet in New York—or don’t enforce it, or are not on the scene when violations occur. Protesters have also taken photos of women, their escorts, their cars and license plates. Of the twenty-eight amicus briefs, by far most are in support of the clinic access law. Amici include the Anti-Defamation League, the American Medical Association and the US Conference of Mayors. Meanwhile, amicus briefs siding with the petitioners came from the Cato Institute, Bioethics Defense Fund and twelve other states. The Supreme Court Opinion will be handed down sometime between now and June. In this case, as Massachusetts goes, so goes the nation.